Lettuce is probably one of our most popular vegetables, any respectable sandwich wouldn’t be seen dead without it, and luckily it’s one of the easiest crops to grow. They just need at least 5 hours of sunlight a day and the two W’s. Water and weeding. A layer of organic matter around the plant will help keep the soil moist and keep the weeds away. Most lettuce heads will mature in and around 50 days with certain varieties taking a bit longer. Don’t have a garden? No problem, you can grow indoors in a container thanks to their shallow roots. In terms of care, all that your lettuce asks of you is to water it deeply at least once a week and it will repay you by producing an abundance of juicy leaves and being one of the first crops to yield in the spring. The hardest part of growing carrots comes at the beginning and just involves getting the correct soil conditions. After that it’s plain sailing, and before long you’ll be munching away with 20/20 vision. You need light and sandy soil to begin with and should aim to sow your carrot seeds at evenly distanced spaces. This may not seem significant but helps in keeping away the Carrot Root Fly. Yes they have their very own fly, which are cuckoo for carrots and you can also avoid them by grow later in the season or near strong smelling crops like chives or garlic. After that you just need to keep on top of the weeding to produce glorious homegrown carrots. This impressive golden plant with long, sword-like leaves hails from New Zealand, will produce white flowers in spring and yellow berries in Autumn. It can be grown in large containers outside and needs very little attention, just some slow release fertilizer from time to time. Best of all, unlike us, it just loves Irish weather. Once you have prepared the soil and gotten the flowers off to a good start, the perennials will not let you down. Don’t forget you only have to do the planting once as perennial means they will come back each year (all going to plan). Once you’ve done the prep they’re quick to establish themselves in the plant world as they set about slowly reclaiming more ground around them and thus driving away the weeds. This means little back breaking work for you and all they require is a little water for their efforts. This small leafy houseplant comes in a range of sizes and styles and is perfect for someone who can’t be trusted with a needy plant. The Red-edge Peperomia will add a splash of colour to any room and is happy minding its own business at normal room temperature and a wee bit of water. This low maintenance plant is the perfect tree to invite inside. Glossy green leaves and its intertwining trunk make for a decorative corner display. They need regular light watering and love lots of indirect light, so put them in your brightest room and try not to move them too much as they will shed leaves easily and dislike being disturbed. The odd bit of pruning and fertiliser for the soil will help too. Known as sunflowers because they turn their heads to track the sun all day, they do half the work for you. You just need to plant them in the sunniest, sheltered spot in your garden. Get them off to the best start by sowing them indoors in the warmth of your home and put them outside in spring with a bit of mulch. The taller they get they may need a bit of support with some string and a pole but very little attention and are sure to brighten up your garden. Sweet peas are a great plant to grow due to their delicious scent with gorgeous colourful blooms.Some can grow up to 6ft (with support) but there are shorter varieties if that seems a little daunting. The earlier you start planting the better as they prefer cooler conditions, they can be started indoors in biodegradable pots so they can be easily transferred to soil. They have sensitive roots so best not disturb them. After that you may need to tie them to a trellis as they grow and refresh with fertiliser every few weeks. Nigella, also known as Love Mist, is one of the easiest flowers to plant and will spice up your garden with a hint of beautiful wildness. They just need well-draining soil and a sunny spot in your garden to thrive. Once planted they just require a bit of pruning, water and the odd feed. 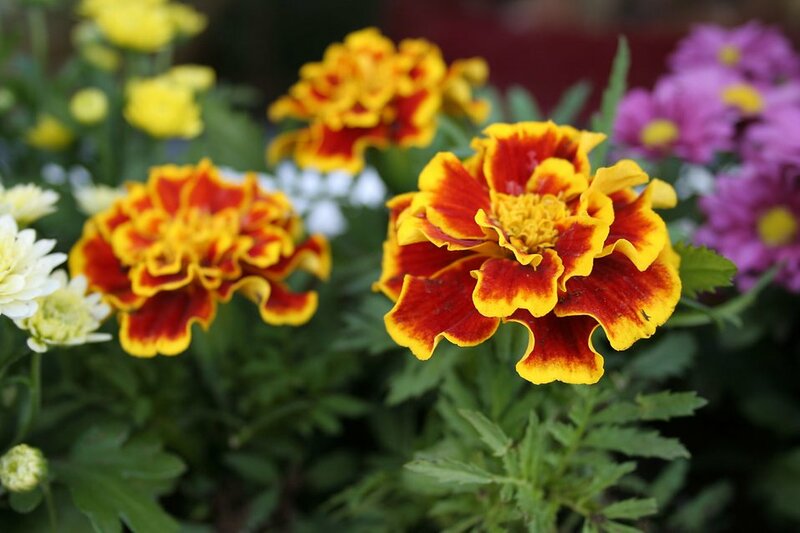 Marigolds need lots of sunshine to stay bright and cheery so reserve your sunniest spot for them. There are a few varieties to choose from, tall, short or daisy-like. Keep them inside until it’s warm enough to introduce them to the soil outside. They usually make do in any kind of soil but try and use well drained and fertilised soil if you can. They should bloom pretty quickly, within three weeks, and just need light watering at their base if there’s been a particularly dry spell. Youy really don’t want to lift a finger do you? Well, these plants are perfect for you, easy to care for and rarely fall victim to pests or diseases. While these cactus-like plants don’t need as much water as most plants, they are not super-plants and will need some hydration to survive. They will last a long time indoors without water but will not thrive or grow so watering once a week or when the soil seems dry is recommended. All you need to do is to decide which ones you want from their many colours and varieties.